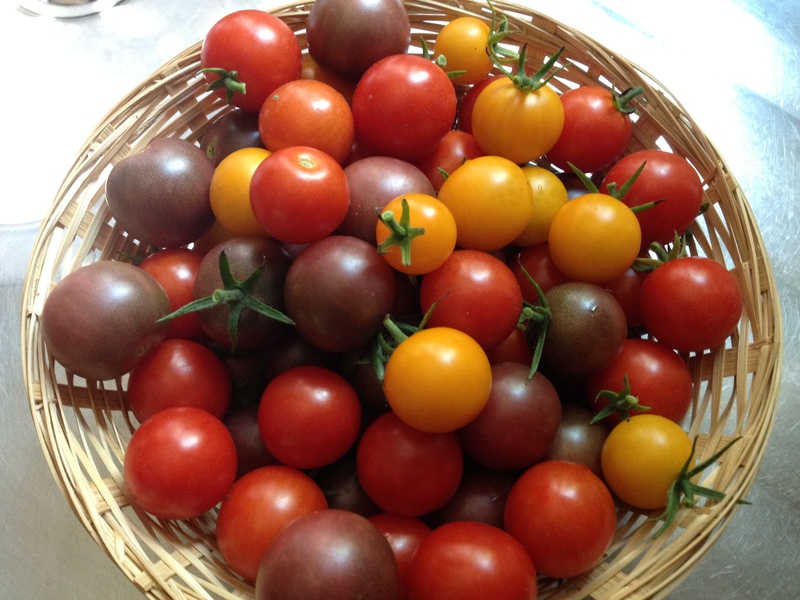 Rinse and dry cherry tomatoes. 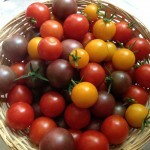 Place tomatoes in Dutch oven or heavy roasting pan. Combine balsamic vinegar, olive oil, salt and pepper and whisk to blend. 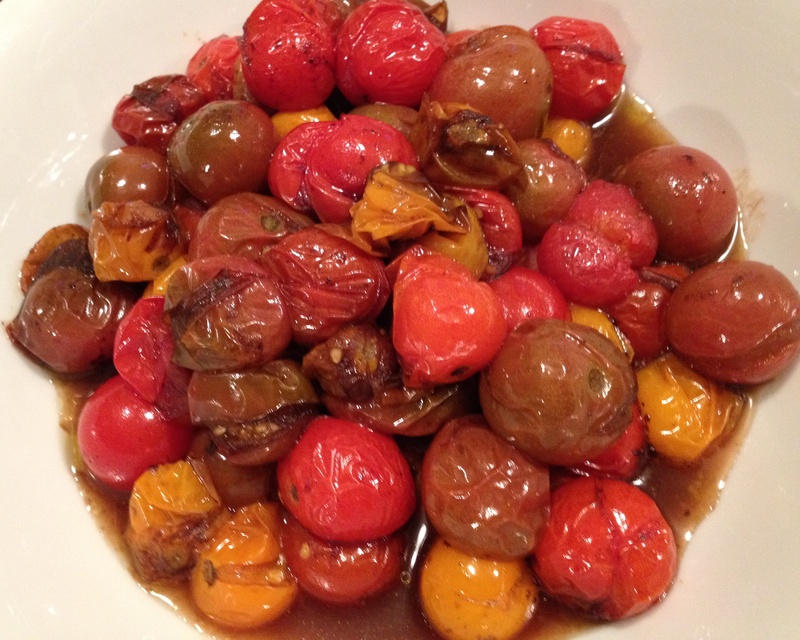 Pour balsamic mixture over tomatoes. 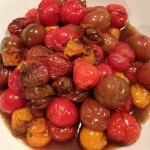 Place tomatoes in oven, uncovered, and roast for twenty minutes or until just bursting. Delicious served with grilled meat. As featured at Rock-Out with Your Cook-Out! Pour warm water and bourbon into a shallow container. Place the cedar papers into the water to soak for 30 minutes. Preheat the grill to 450-degrees (or use a grill pan or non-stick skillet). Make cuts across the salmon filet to yield twelve 1-1/2-inch pieces. Lightly brush both sides of each piece with olive oil. Remove the cedar papers from the water and shake off excess liquid. Place a salmon piece in the center of each cedar paper and wrap the sides up to completely enclose the salmon. Place the salmon packets seam-side down on the hot grill. Close the lid and grill for 4-5 minutes. Flip each packet and grill for an additional 3-4 minutes. Serve seam-side up. A Blast from the Past! 1974 Pillsbury Bake-Off Grand Prize Winner! Heat oven to 350°. In a medium bowl, mix cream cheese and 1 tablespoon softened butter; beat until smooth. Add chicken, chives, salt, pepper, milk and pimientos and mix well. Separate dough into 4 rectangles, firmly pressing diagonal perforations to seal. Spoon 1/2 cup chicken mixture onto center of each rectangle. Pull 4 corners of dough to center of chicken mixture; twist firmly. Pinch edges to seal. Place packets on ungreased cookie sheet. Brush tops of packets with 1 tablespoon melted butter; sprinkle with crushed croutons. Pre-heat oven to 350°. Grease a 13×9-inch pan. Lightly spoon flour into a measuring cup and level off. In a large bowl, combine all crust ingredients; mix at low speed until crumbly. Reserve half of the crumb mixture (about 3 cups) for topping. Press the remaining crumb mixture in the bottom of the greased pan. Bake at 350° for 10 minutes. Meanwhile, in a small bowl, combine the caramel topping and 3 tablespoons of flour; blend well. Remove partially baked crust from the oven. Sprinkle with chocolate chips and nuts. Drizzle evenly with the caramel mixture and sprinkle with the reserved crumb mixture. Return pan to the oven. Bake an additional 18 to 22 minutes or until golden brown. Cool 1 hour or until completely cooled. Refrigerate 1 to 2 hours or until filling is set. Cut into bars. 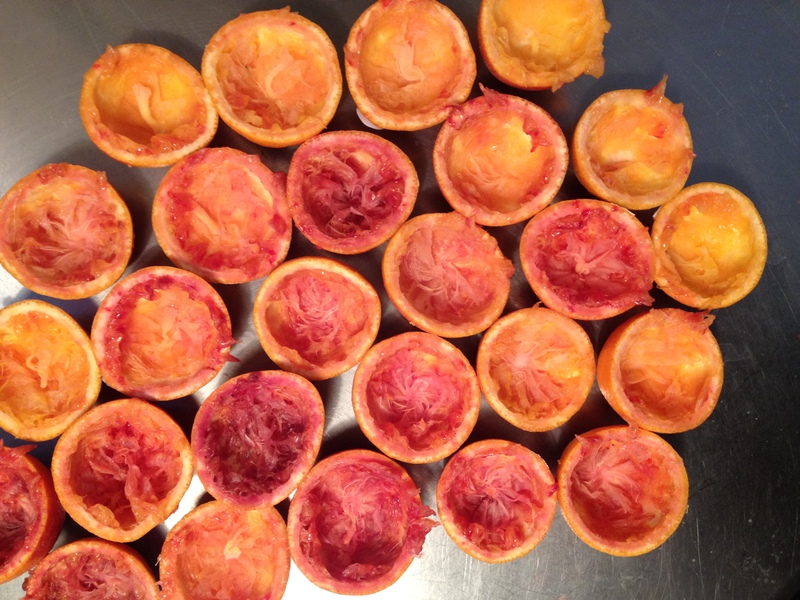 Mash the blood orange zest with one teaspoon of the sugar to release its oil. Stir the remaining sugar into the blood orange juice and let it stand until dissolved; Stir in the zest and the lemon juice. 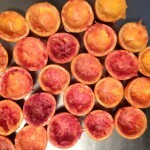 Refrigerate until thoroughly chilled, about 2 hours. Freeze the mixture in an ice cream maker according to the manufacturer’s instructions. Or, to freeze without the ice cream maker, pour the mixture into an 8- or 9-inch metal pan or a half-gallon plastic container. Cover and freeze until firm, about three hours. Transfer to an electric mixer or food processor and beat until light and fluffy. Transfer to a container, cover, and freeze until firm, about 1 to 2 hours. Serve garnished with mint leaves. Cook sausage in a Dutch oven or large soup pot until nicely browned. Remove from pot and set aside. Add bacon to pot and cook until crisp. Remove bacon and set aside, reserving 1 tablespoon of drippings in pot. Add onion, green pepper and garlic to pot and cook 2 minutes, stirring constantly. Add beans, undrained tomatoes, vegetable broth, tomato sauce, bay leaf, seasoned salt, thyme and pepper. Bring to a boil. Cover, reduce heat and simmer 20 minutes. Add chopped potatoes, cover and simmer for an additional 20 minutes. Add reserved sausage and bacon, cover and simmer 20 minutes or until potatoes are tender. Remove bay leaf. Ladle into bowls, sprinkle with parsley and serve. Melt butter in large Dutch oven or soup pot. Add celery, carrots, onion, cauliflower, broccoli and garlic and cook over medium heat until vegetables are crisp-tender (4-5 minutes). Add flour all at once, stirring until smooth. Cook 1 minute, stirring constantly. Add vegetable broth and cook over medium heat until soup is thickened and bubbly. Cover, reduce heat and simmer 20 minutes or until vegetables are tender. Add white pepper, milk and cheeses and stir to combine. Check seasoning and add salt to taste. Cook over low heat for ten minutes, stirring occasionally. Ladle into bowls and top with sliced almonds. Cube the butternut squash. Peel and slice the carrots. Peel and chop the onion. Peel and crush the garlic. Peel, core and cut up the apples. In a large pan, melt the butter and saute the onion to soften. Stir in the garlic, squash and carrots and cook for 5 minutes. Add the apples and stock. Bring to a simmer and cook for 30 minutes or until vegetables are tender. Transfer soup to a blender and puree until smooth and golden. Transfer back to pan and add salt and pepper to taste. Briefly reheat. Serve with fresh croutons and cracked black pepper. * Note: To increase the richness of this soup (and calories), add 1/2 cup half and half or heavy cream during the final heating step. Soak the porcini mushrooms in 2 cups of boiling water for 15 minutes. Heat the olive oil in a medium-sized saucepan and add the onion, salt and pepper. Saute for 4 minutes and then add the garlic. Saute for 2 minutes and add the fresh mushrooms and chestnuts. Saute for an additional minute and add the vegetable stock. Drain the porcini mushrooms, reserving the liquid. Rinse and chop the porcini mushrooms and add them to the soup. Strain the reserved liquid through cheesecloth (or paper towels) to catch any grit and then add the liquid to the soup. Simmer for 20 minutes. 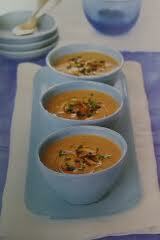 Advance Preparation: Soup may be refrigerated for up to 2 days and may be frozen for up to 4 weeks. Bring a large pot of salted water to boil. Add the kale and cook for 4 minutes. Quickly drain and rinse in cold water. Set aside. Heat the olive oil in a large, heavy-bottomed pan over medium-high heat. Add the onion and season with salt and pepper. Saute for 12 to 15 minutes until the onions are golden brown and caramelized. Add the stock, kale and meatballs to the onions and heat through. Ladle the soup into small cups (8 servings) or bowls (4 servings) and garnish with shaved Parmesan Reggiano. Advance Preparation: The onions may be caramelized up to 2 days in advance. The soup may be frozen for up to 4 weeks.